A Milford, Conn. gas station owner says he's lost "quite a few" customers because of an anti-Obama billboard posted above the station. A Milford, Conn. gas station owner blames an anti-Obama billboard for scaring away business. The sign is posted above USA Fuel on the Boston Post Road near High Street in Milford. 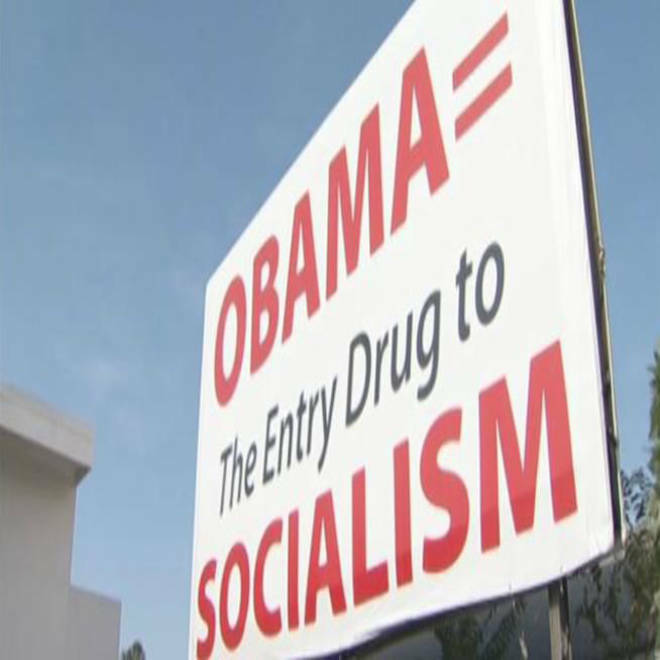 The billboard reads "Obama = The Entry Drug to Socialism." This story originally appeared on NBCConnecticut.com. "I’ve lost a few customers, I’ve lost quite a few," said Fayez Ghaly, owner of USA Fuel. "They either don’t come back or they’re really upset about it. We try to explain to them it’s not our sign and we can’t do anything about it." The store has dropped gas prices to try and lure customers back. "It’s actually been driving us crazy, because everybody thinks it's straightforward that it is our sign, because when you look at it the first time, you think it’s on our property," said Moe Boulas, a USA Fuel employee. The sign is owned by DeForest Smith of George J. Smith and Son Real Estate. He said he put it up because someone had to share a message that he believes many agree with. "He (Obama) is, in my opinion, running this country into socialism while he bankrupts us," said Smith. Smith said he didn’t want the sign to negatively affect any Milford businesses. "I’d never, ever would intentionally hurt a small business person," said Smith. He said he would be willing to discuss the sign with Ghaly, but hasn't heard from him. Ghaly, however, said he contacted Smith and Smith told him the billboard will stay up through Election Day.